We’re pre-releasing new Neighborhood (Census Tract), Zip Code and County level micro market maps to you early. 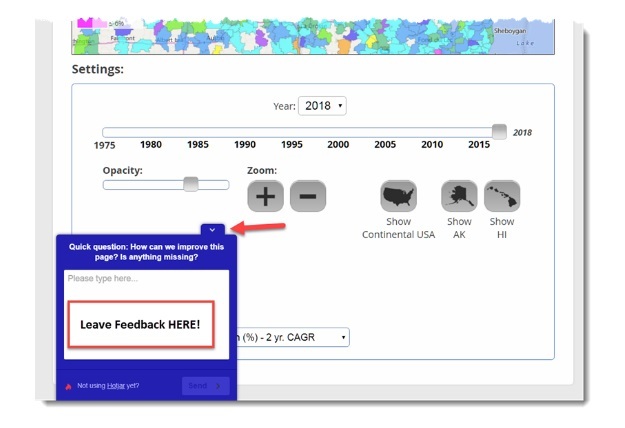 We encourage you to suggest new features, report bugs and provide feedback using the blue 'feedback’ tool in the bottom left. Micro Maps are available for Silver, Gold and Pro members at no additional charge. All CURRENT members will be grandfathered. Your price will never increase so long as you remain an active member. 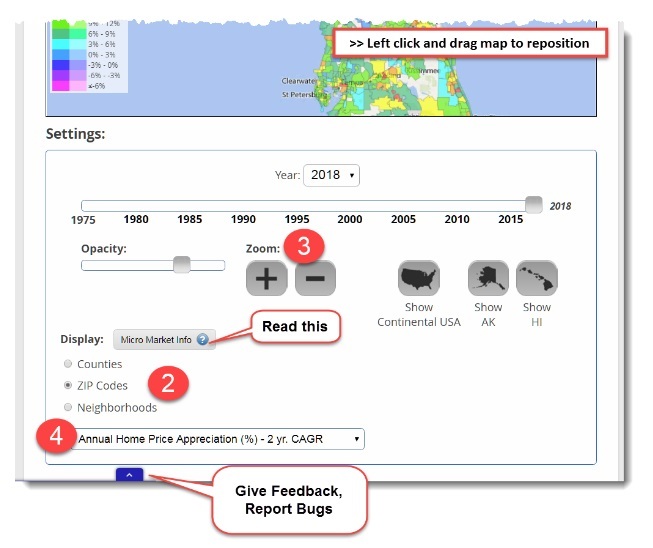 #1 – Select "Micro Market Maps" from the Dashboard or the drop-down menu. #2 - Select between Counties, Zip Codes or Neighborhood maps. As you decrease a market’s geographic size (for ex, from City to Zip Code level) you get fewer house sale transactions in a given time period. Statistically speaking, you need a minimum of 25 transactions to get a useable sample size. 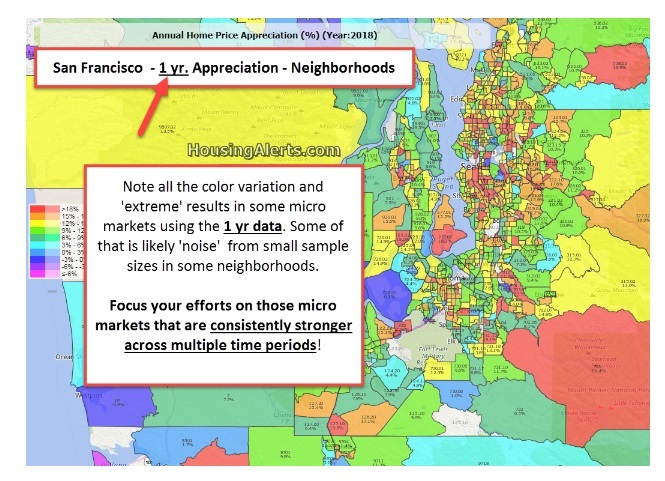 Micro Markets with fewer than 25 transactions do not have enough useable data and are not shown in color. Obviously, sparsely populated rural areas account for most these, but you will also see it in urban city-centers where land values are high, leading to fewer houses and more commercial real estate.In some cases, the zip code or neighborhood boundaries (set by the Post Office or Census Bureau) are so small, there were not sufficient home sale transactions to meet the minimum threshold. An extreme example of 'statistical noise’ would be flipping a coin 3 times, having it come up heads all 3 times, and concluding coins ALWAYS come up Heads. The incorrect conclusion arose from too small of a sample size. If you increased your sample size by flipping the coin 100 times, the 'true’ conclusion would become apparent: coins land on Heads 50% of the time. 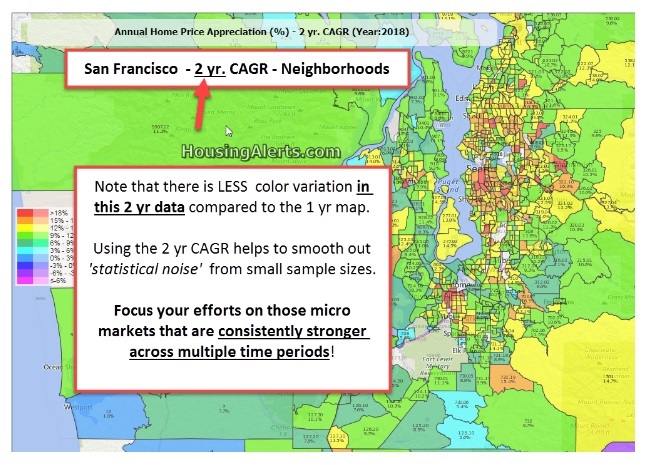 As you move from big to small market areas, for ex, from City ➔ County ➔ Zip Code ➔ Neighborhood the statistical noise can increase depending on how many actual houses sold during the period (but not anywhere near the error rate in the coin flipping example above). 2) Use multiple period CAGR (Compound Annual Growth Rate) data. We currently have these 5 sets of data you can map for Micro Markets (and will soon be adding a sixth: Master Score). Focus your efforts on those micro markets that are consistently stronger across multiple time periods! When looking for hot micro markets within a city-level (macro) market, you want to look for strong RELATIVE performance (i.e. - compared to other micro markets in the same city). An individual zip code or neighborhood is NOT a market. They are sub-markets and STRONGLY trend along the same lines as their 'parent’ or city-level market. While there can be strong and weak sub-markets WITHIN a particular city, you should ALWAYS start your search in this order:1) Locate a strong Macro (City-level) Market2) Then (and only then) drill down INSIDE that market for relatively stronger micro markets. You should not START with the micro level market (unless of course you have intentionally limited yourself to a single city-level market). 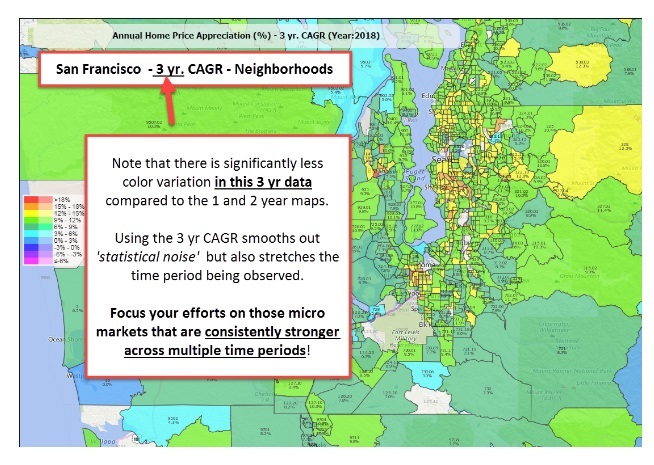 Generally, you will get dramatically better results in a stronger CITY level market (even if the micro market is mediocre) than investing in a weak city-level market (even if the micro market is red hot). In a hot macro market, a rising tide lifts all boats. In a weak macro market, sub markets can rarely go against the tide for any sustained period and eventually perform in line with its parent market. We’re developing a new, in-house mapping system to allow full screen viewing (on any device) and faster page loads. 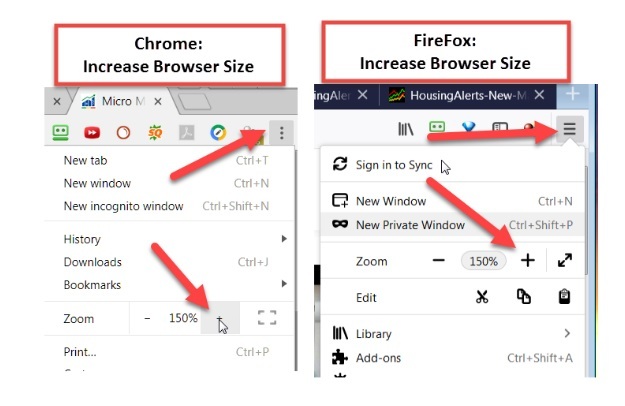 To get the most out of this legacy mapping system, try increasing your BROWSER size. 3) If map loads slowly, reload the page. 4) Leave feedback; tell us what YOU’D like to see! What’s Next w/ Micro Markets? 3) Master Score algorithm and mapping. 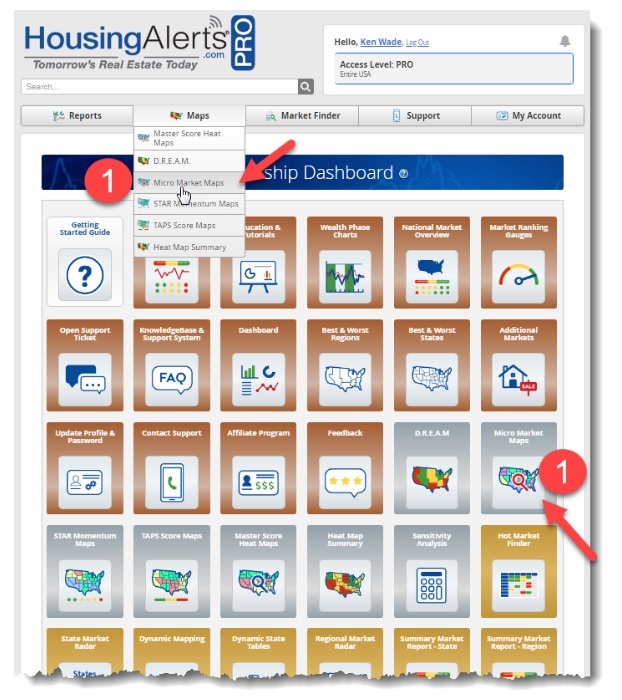 4) Hot Market Finder Tool for Counties, Zip Codes and neighborhoods! !